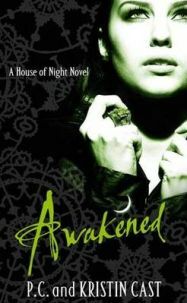 Awakened is the eighth novel in the popular House of Night series by P.C. Cast, along with daughter Kristen. In the beginning of the series, Zoey Redbird, a teenager in Tulsa, is Marked to become a vampyre, but it soon becomes clear she is not just any vampyre due to the strange and sophisticated markings that are given to her by the Goddess Nyx. She soon finds herself embroiled in events beyond her control, as evil threatens her and her friends. Having read all the previous novels, I was keen to continue the story with Awakened. After the grief of book six (Tempted) and the uncertainty of what would happen in book seven (Burned), Awakened opens with Zoey and her Guardian, Stark, enjoying some well-earned rest. But life doesn’t work that way for Zoey, and before too long events are unfolding back in Tulsa which she needs to return to. I’ve found over the course of the series that I enjoy the books more and more; while Zoey’s American teen-speak really annoyed me at first, I’ve grown used to it and it has also faded somewhat as the series goes on. In addition to that, Awakened follows the pattern of the last few books in that Zoey is not the only narrator – we hear from most of the main characters such as Stevie Rae, Neferet, Kalona, Rephaim and Stark, although Zoey is the only one in first person. While previously this served to give the reader different perspectives on events, in Awakened it is actually more of a necessity, as Zoey is away from Tulsa for quite a lot of the book, so she can’t tell us what is going on there. Following the tragedy which closed Tempted and led to the events which took place in Burned, I didn’t think we would be subjected to more grief just yet. But Cast pulls no punches, and once again tragedy strikes Zoey and her friends. The loss is truly devastating, because again it is someone so good and innocent that right up to the end you really believe that everything will be ok – because surely a character like that can’t die? But of course they can, and the emotions that the tragedy causes, while not necessarily evidence of supreme writing skills, are testament to the story that Cast has created, and how involved the reader has become. Aside from the tragedy, Awakened is a slightly calmer novel than previous House of Night novels. There are less earth shattering events, more reflection and more focus on relationships. There may not have been the action of previous novels, but it still had my attention from start to finish. Like Burned, Awakened has a slightly more mature feel to it than the earlier novels did. This is partly due to the reduced role that the characters of the Twins and Aphrodite have, but also because some of the characters have matured. However, Stevie Rae has a larger role in Awakened as her story grows, and I find her a slightly immature character. After reading Burned, I was a bit annoyed by the section which took place on the Isle of Skye. Cast’s use of written Scots was flawed, and I wasn’t convinced by her claim that she used Gaelic in an ancient form. Awakened features a section which also takes place on Skye, and although it is not as obvious as in Burned, the irritations are still there. The written Scots is better than it was in Burned, but still not right. However, as the character who speaks Scots is in a smaller role, it wasn’t such a problem. What did jump out at me was that Zoey referred to a purchase she had made on the island, and how much she had paid in Euros. Skye is part of Scotland. Like the rest of the UK, our currency is Sterling. You could argue that tourist shops in the UK may accept Euros, but having been to the small shops on Skye I doubt that would be the case there. Anyway, Zoey has been on Skye for a while, when she was in Italy during previous books she wasn’t there long enough to get cash and do some shopping, therefore leaving her with Euros to spend, so she should have had pounds if she had used a bank on Skye. To sum up my little moan, it’s a poor piece of research. I thoroughly enjoyed Awakened, and look forward to the next novel in the series. The House of Night series is written primarily for a teen audience, but it is one of the better vampire/supernatural series out there, and it does appeal to a lot of older readers.